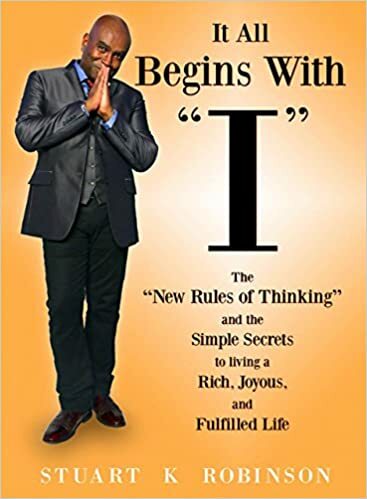 It All Begins with ‘I’: The “New Rules of Thinking” and the Simple Secrets to Living a Rich, Joyous, and Fulfilled Life by the multi-hyphenate (successful actor-writer-singer-songwriter-director-casting agent-acting coach-entrepreneur) Stuart K Robinson, is a perfect book for anyone who is looking at their life and wondering is this all there is? How can I feel the joy of living and purpose in life again? I must disclose that I have known Stuart for over 40 years (!) and am delighted that his talent and hopeful philosophy is now being discovered by the world. He speaks with warmth, humor and common sense, and is the first to admit that he is not saying anything we don’t already intrinsically know. He just gently nudges that part of us that knows we can, and must, do better. I was lucky enough to see him at a book signing and got a chance to hear him share his own amazing journey out of poverty in the depressed northeast to an almost ideal life in Los Angeles. For a kid who barely spoke, he has a lot to say and it’s all inspiring. I never knew a lot about his past, but his present includes a loving and talented wife Maureen, who is a performer in her own right, two beautiful daughters, Nicolette Robinson Odom and Ally Robinson, who are pursuing their own path to fame, and a large and supportive extended family consisting of his blood relatives and dozens of life-long friends of which I am privileged to be a part. Published by Tallfellow Press, the book is available now on Amazon and Barnes and Noble. Do yourself a favor and buy it. Savor each insight, copy down his tips on a Post-It, stick on your bathroom mirror as a reminder and then go live your best, highest life! Let me know what you think; and if you like the book, please feel free to write a review on Amazon or Barnes and Noble.